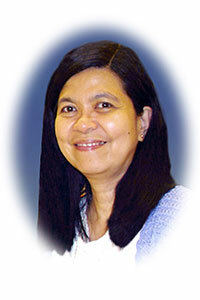 Sister Julie Macasieb was born and raised in Binmaley, Pangasinan, in the northern part of the Philippines. She was the only child of Felipe Vinluan Macasieb and Leonila Gale Macasieb. She was nurtured by her parents with love and care and grew up living closely with her grandmother, aunties, uncles and cousins. Julie received a certificate in religious education at St. Benedict Religion Teacher Formation Center at Vigan, Ilocos Sur. She worked as a professional catechist for three years at her home parish, Our Lady of Purification Parish, and at St. John The Evangelist Cathedral in Dagupan City, Pangasinan. While teaching, she continued her studies for a Bachelor of Science degree in secondary education at University of Pangasinan, Dagupan City. Her recollection of meeting the Sisters of Providence dates back to the summer of 1987, when she was introduced by a friend to Sister Felma Cerezo. This meeting with Sister Felma came at a time when Julie was discerning her call to religious life. The following year, she met other Sisters of Providence: General Superior Madeleine Leblanc, Roberta Rorke, Barbara Schamber, Kathryn “Kitsy” Rutan and others who were part of the provincial councils of the three western provinces. They had come to the Philippines to look at the possibility of starting a mission and foundation there. Meeting the Sisters of Providence, Julie immediately was filled with a sense of joy. What drew her to the Sisters of Providence was their hospitality and care. Julie entered the Sisters of Providence as a candidate on November 10, 1991, and became a novice on May 31, 1993. She was the first to enter the community in the Philippines. Sister Julie made her first profession of vows on June 10, 1995. Since then she has had theological studies as part of her initial formation program. She also completed academic requirements for a master’s degree in religious studies at De la Salle University, Taft Avenue, Manila. She took short courses on formation at Our Lady of Peace and Guidance Center, on spiritual direction at the Center for Ignatian Spirituality, and on family dynamics and counseling at the Center for Family Life Ministry at Ateneo de Manila University. After three years of preparation for apostolic ministry, she began full-time campus ministry and has served at a number of Catholic schools and universities in Manila. She described her active engagement in the apostolic ministry for 17 years as life-giving and fulfilling. The experience of accompanying young students as they discover their true identity and becoming part of their journey in their human and spiritual growth is a privilege for her. By offering her time to listen to their fears, concerns, aspirations and hopes, and simply being present to them and with them, are some ways in which the students felt God’s love, mercy and compassion. Also part of Sister Julie’s ministry is her community’s call to be a member of the leadership team and in vocation/formation. Sister Julie considers it a joy to be part of an international, intercultural and intergenerational community. Just like other forms of calling, the joys, pains, tears, griefs, challenges and hopes are all manifestations of the journey of saying “Yes” to the mission. What sustains Sister Julie in her continuing “Yes” to this point of her journey is her love relationship to God: allowing God to love and embrace her. In moments when she feels God is “seemingly” absent and when things get tough, she holds fast to the assurance that God is with her. God’s love and grace are enough, and she just entrusts everything to God in total confidence. Other factors that sustain her are the prayerful support of her sisters in community and persons that God gifted her with being part of her journey. Currently, Sister Julie is ministering in the Archdiocese of Lingayen-Dagupan, responding to urgent needs, particularly with women and children. She ministers as spiritual counselor at the Women’s Center. She collaborates with St. Michael the Archangel Parish in pastoral ministry and as an archdiocesan coordinator for pastoral care for migrants and itinerant people. She carries out the mission of Providence by visiting and assisting the poor, advocating an end to violence against women and children and support for widows and their children, facilitating values formation for women detainees and child development workers, and helping in the parish’s livelihood program for the poor. Sister Julie discovers her strengths but knows that she cannot do everything. However, she says it is in her limitations that she discovers grace, allowing God to work within her. Sister Julie also considers her going back and serving in her home diocese, which is now part of the mission of Providence, as a blessing and a gift. What is the meaning of this Jubilee milestone for her? She exclaims: “Gratitude to God is overflowing for this 25 years of grace.” It is purely God’s gift. Because of God’s unconditional love, compassion and faithfulness, she is able to respond in love, compassion and faithfulness. Sister Julie looks forward to this 25th Jubilee as an opportunity to take time for renewal, in particular on her 30-day retreat, and to celebrate God’s loving care and faithfulness with her community, relatives, friends and all who have become part of her journey for this 25 years in gratefulness to God’s Providence. What sustains Sister Julie in her continuing “Yes” to this point of her journey is her love relationship to God: allowing God to love and embrace her.